Visit our Farm Store, taste and purchase our cheese, bring a picnic and bottle of wine and soak up the beautiful Vermont countryside. 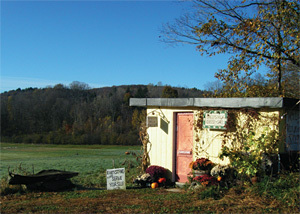 The farm store is open 7 days a week from 9am to 5pm. We carry yarn, soap, lamb meat, maple syrup, Vermont Shepherd cheese, Invierno cheese, Ricotta Lana Salata cheese and accompaniments for the various cheeses. Come and taste our cheese, view our fields and see a few of our sheep! Our small, rustic farm store has samples to taste and wedges of cheese to buy (1/4 lb - 2 lb pieces). If you would like to purchase a larger piece of cheese while you're in our area, please email us info@vermontshepherd.com, let us know the quantity you are looking for and we will have your cheese ready for you when you arrive. Because we are busy farming and making cheese, visitors are discouraged from visiting our farm and facilities. The farm store is a great way to get a "taste" of what our farm and cheese is all about! We appreciate your understanding! Our small rustic farm stand, located near beautiful sheep pastures, offers a great way to pick up a wedge or two of our cheese year round. Check here for occasional farm and cheese cave open houses. When are the cheeses available? The supply of Vermont Shepherd Cheese is limited. While we make Invierno year-round, the Verano is hand made during the spring and summer months and then ages for 4 to 8 months. Invierno is available most of the year, while Verano is available from late August until the year's supply runs out in the spring. Visitors can taste and purchase our cheeses and other products at our Farm Store located on the road into our farm, 9am-5pm, 7 days a week, year round. Directions to the Vermont Shepherd Cheese Store From Points South: Take I-91 to Vermont Exit #4 (Putney). Go 1 mile to the center of Putney. Turn left at the Putney General Store.. Go 6 miles on this road (Westminster West Rd). Take a hard right, after a small bridge, onto Patch Road ( The first paved road on right). Go 1/4 mile and turn right at Patch Farm Road, and go 1/4 mile to the Cheese Store located on the Right. From Points North: Take I-91 to Exit #5 (Westminster Exit) Turn left after exiting interstate, then take your first right.. Take your first right onto Westminster Heights Road (which changes to Kurn Hatten Road and then to Patch Road). Go 6 miles and look to the left for our small Vermont Shepherd sign. Turn into Patch Farm Road, and go 1/4 mile to the Cheese Store located on the right. From Rutland/Londonderry: Take Rt 103 to Chester, VT. Before you reach the Rockingham Vermont Country Store, look for a small sign that says "Broc Ways Mills" on your right. Take the next right onto Pleasant Valley Road. Follow Pleasant Valley Road until it ends. Take a left and follow this road for about 1/4 to 1/2 of a mile until you come to the town of Saxtons River, VT. Take an immediate right onto Westminster West Road. Go 6 miles. Turn into Patch Farm Road, and go 1/4 mile to the Cheese Store located on the Right. Approximate travel times: From NYC: 4.5 hours. From Boston: 2.5 hours. From Burlington, VT: 2.5 hours. From Londonderry, VT: 55 minutes Recommended Inns and B&Bs: . 802 254 6268 Hickory Ridge House, Putney: beautiful, old brick colonial, great breakfasts, located about 4 miles from Vermont Shepherd cheese store. 802 387 5709 Ranney Crawford House, Westminster West: 1 mile from Vermont Shepherd cheese store. http://www.ranney-crawford.com Saxton's River Inn, Saxton's River: old inn in a small village about 6 miles from Vermont Shepherd cheese stand (en route to Grafton). 802 869 2110. There are also several Air B&B's in Westminster West.